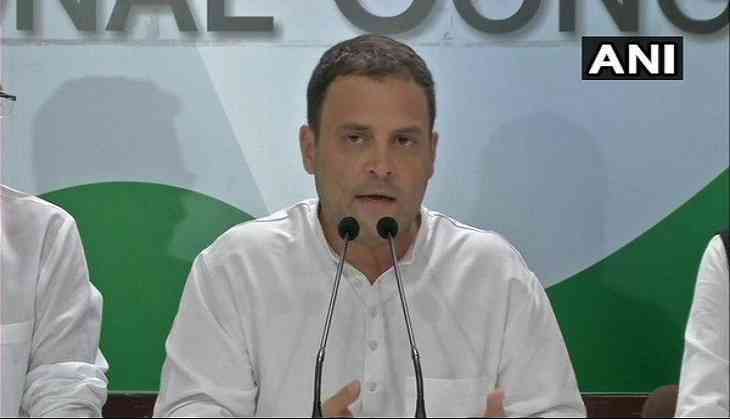 Congress president Rahul Gandhi on Friday attacked Prime Minister Narendra Modi-led Central Government saying, "The Indian Government has gone to war with its own people because it wants to impose one imagination on 1.3 billion of us." Speaking at the HT Leadership Summit, the Gandhi scion asserted, "It wants to impose one singular, suffocating memory on 1.3 billion memories." Giving his speech a political flavour, Rahul Gandhi accused the government of not allowing fresh thinking in the country. "Gauri Lankesh is shot dead because of what she wrote. Fresh thinking is unwelcome. In fact, forget about fresh thinking, they hate thinkers: Raghuram Rajan, Amartya Sen, the list goes on," he said. "Institutions are being destroyed. Supreme Court judges are compelled to go public because they feel intimidated. In the same breath that they spoke of their fears, they spoke of Judge Loya. The sole qualification of Vice Chancellor after Vice Chancellor chosen to lead India's top universities is that they belong to the RSS. Many of you in this room are victimised and harassed by the authorities. You face institutionalised extortion and arbitrary cases. I would like to ask how many of you are NRIs, how many of you tell your children not to come back to India after college because things have gone horribly wrong. But I won't ask you that today in sight of all these cameras. Today in India, the fear is palpable," he added. Taking a dig at the Bharatiya Janata Party (BJP)-led National Democratic Alliance government at the Centre, the Congress president said, "While India burns, all they do is talk but their slogans. But their slogans have a shelf life: Make in India. Start up India. Clean India. What exactly have they translated into? Nothing. Because the people in charge are convinced that they have a monopoly on knowledge. They are convinced that only they understand. That no one in this country understands anything about India or the dreams of its people except them," Rahul Gandhi said.